Burnished pottery is decorative and not meant to hold water. Potters who burnish are often asked "what glaze is that?" by curious admirers of their work. Non-potters naturally assume all pottery is glazed, and the glossy surface of a burnished pot seems like a different and intriguing sort of glaze. Though glazed pottery can be brighter and more colorful, a burnished pot has a glow from within and a warmth that glazed pottery doesn't possess. The difference which non-potters sense without knowing it - and which fascinates potters - is that the surface of a burnished pot doesn't bear a coat hiding the clay itself from view. Glaze is glossy and reflective, but the reflecting surface consists of a millimeter or so of glass covering the clay. Underneath this layer of glaze the rough stony clay is always perceptible even if not always visible. A burnished pot can have a surface just as glossy and reflective as any glaze, but behind this glorious surface there is no hidden roughness. Even the feel of a burnished pot is seductive - while a glazed pot feels hard and cold, a burnished pot seems warm and almost soft to touch. Potters who burnish get used to seeing their customers handle the pots, turning them in their hands and stroking the surface. This is a common and unconscious response to the sensuousness of burnished pottery. 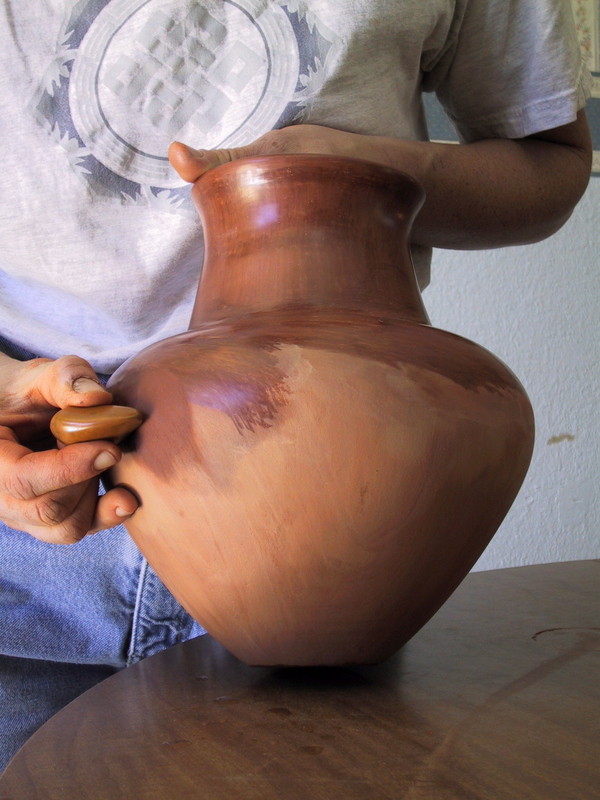 Burnishing is the technique of polishing the surface of a pot by rubbing it with a smooth stone. The Pueblo Indians of the Southwestern United States use burnishing, as well as coil-building and smoke-firing, to make their famous black pottery. I have adapted these techniques in a series of vessels painted with flowing geometric patterns and stylized animal forms. These pots are coil-built to create sensuous forms, and smoked to blacken the naturally red clay. My "Earth Mother" figures evolved from these coil-built vessels. I often make an egg-shaped closed form, then cut a hole in it and continue coiling to add a neck. One time, I pressed in the side of such a form and all of a sudden it looked to me like a caped woman. As a result of this happy accident I have ended up creating a whole series of these caped female figures, which embody the idea of a woman as a "vessel" for new life.